Welcome to my introductory post! This is my very first Armchair BEA event. I'm looking forward to participating. The lovely folks over at the Armchair BEA site have asked us to introduce ourselves by answering a few questions. Howdy! I'm Jennifer and I've been blogging for just under a year. I used to drive my Facebook friends nutty by flooding their feeds with book stuff. I decided to start a book blog when my sister begged me to stop gently suggested that I needed a different outlet for all of my bookish thoughts. Tah dah! 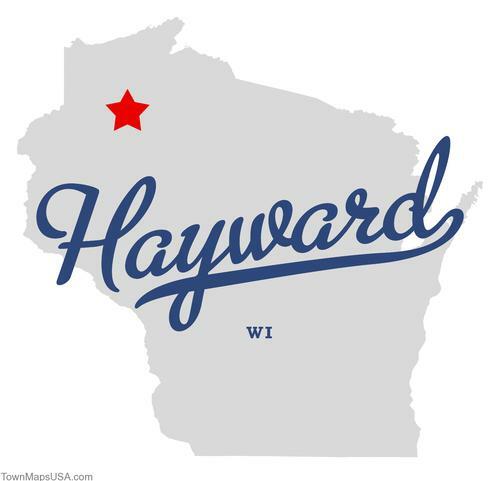 I'm located in the lovely north woods of Hayward, Wisconsin. Hayward is a small city of just over 2000 people. Our claims to fame? The Lumberjack World Championships, the American Birkebeiner ski race, and the National Freshwater Fishing Hall of Fame. I don't want to sound like I'm bragging but do you have a humongous 4-story fiberglass musky in your town? I thought not. Right now I'm participating in a readalong of Under the Dome by Stephen King. I put together a Hall of Fame post to highlight my favorites from the first quarter of 2013. One book that I keep telling everyone to read is The World's Strongest Librarian by Josh Hanagarne. There are two animals that give me the heebie-jeebies: standard size poodles and hyenas. Gross. Hey, you live further North than I do!!! It can't be that time already. Let the fun and comments begin. Happy BEA. Hyenas ARE gross...except for the silly one in The Lion King. He was funny. True! Those were the only hyenas that didn't make me feel yucky in my tummy! Wow, that musky is impressive! I liked getting to you better. Didn't know you were so close to Canada. My intro post will be up tomorrow. You'll be posting tomorrow like you're supposed to?? LOL, I just realized that it's MONDAY. Way to go Jen!! These holiday weekends turn my brain to mush. The musky - way cool :-) And I love poodles - but teacup Yorkies freak me out, as do Corgies!!! Poodles are kind of freaky. I can imagine you do not like them! I'm not participating in Armchair BEA this year, but I look forward to reading your posts! Thanks Lark :) This is my first time, I'm all giddy! Wow - those are pretty impressive claims to fame Hayward has! We definitely do not have anything nearly as impressive as a 4-story tall musky. Aren't they?? Their shape is so weird and they make me feel UNCOMFORTABLE! It's always fun to learn more about my favorite bloggers :) I hope you have lots of fun with the Armchair BEA. I have friends coming into town from the East Coast and it is a testament to how much I like them that I'm allowing them to come this weekend :) Plus, it's one of their 30th birthdays, so it's not like we could change that. Thanks Allison :) I hope you have a blast with your pals! It's pretty groovy right? I find myself ashamed and proud of it at the same time, lol. Dat muskie is pert-neer awesome, dontcha know! There are going to be a lot of posts here this week. I have a couple of reviews scheduled and will all of the ABEA posts...yikes. I'll plan things out a bit differently next year. 1) I didn't realize you were from Wisconsin! Hayward is actually not that far from my parents' cabin on Bone Lake. 2) I have been telling a lot of people about The World's Strongest Librarian too. It was such a great book! Wasn't that book just so good? It made me laugh like a fool for one thing. Josh is a sweetheart too. He deserves all the success in the world! Hmmm, I'm pretty sure my father is planning on catching that large a fish this week. He's headed up to Pickerel Lake, WI before me as I have to finish the school year here in Illinois. Nice to learn more about you! Good luck to your dad! ;) I didn't know you were a fellow Midwesterner, yay! Oh gosh, Armchair BEA is here already! It's a fun week, I'm sure you'll enjoy it. I'm doing the DomeAlong too. I started listening to the audio Saturday and am already a quarter of the way into it. I'm so glad your doing the DomeAlong! It's been so long since I've read a chunky King and I'm loving it. Standard size poodles? lol Thank your sister for us! I'm very curious if he'll know where it is!! Those big poodles are icky, I agree. And no, I am TOTALLY LACKING in giant fish in my town (I think...I just moved). Nice to meet you! They creep me out beyond belief, lol. Nice to meet you too Jennifer! OMG. If it weren't for the impossible coldness you endure each winter, I'd move to Hayward. A giant musky AND the Lumberjack championships?! AWESOME! Right?! If we didn't have a 9 month long winter this would be the perfect place to live! Your blog is one of those where I thought: how come I didn't discover it earlier (than I id)? And the answer often is: because it's a young-ish blog! I thought you'd been going forever! I think EVERY town needs a giant musky, lol. So...about that musky thing...Why is there a giant statue of one in your town?? Because Hayward is AWESOME? Ha ha, no. It's located on the grounds of the Fishing Hall of Fame ;) Hayward is known as the MUSKY CAPITAL OF THE WORLD though. I bet you're dying to visit! We're hot stuff around here, I'm telling ya! The big shots of Wisconsin, ha ha! Hey Jen! I love big poodles and I don't like the little ones. But I LOVE big dogs! Thanks for dropping by! To be honest I could live without poodles entirely, lol. But those big ones? Oooooh they freak me out! Those are some crazy claim-to-fame notions for your town! My town is famous for it's big St. Patty's Day parade. Pretty amazing stuff right? LOL ;) We live large here in Wisconsin! Ugh, those damn poodles. I'm with you! I do have a very large fish statue at one of our summer cottage destinations ;) It's their landmark as well ! Wait, standard-sized poodles? I can understand cringing at miniature poodles, but the big ones with the neatly-trimmed coat are quite handsome I thought (I hate it when people do the crazy hairstyles on the poor animals, though). It is one giant book, that's no lie! The readalong was a good reason for me to finally get to it! I would totally do the Under the Dome read along, if I hadn't already read it and have so much on my TBR pile. I would mock you for your poodle aversion, but then you might discover my extreme moth phobia. We'll both have to refrain from teasing then won't we? Don't feel bad, my daughter is terrified of moths as well! You aren't alone! That musky is pretty unique. Thanks for the photo as i would not have been able to do justice to it with my imagination! Delighted to meet you, have a great Armchair BEA. That musky is huge! Wow. I haven't read anything by Stephen King, but I know quite a few people enjoyed Under the Dome, so I hope you're enjoying it too. I love your blog layout, by the way. It's so pretty! Awesome fish, right? ;) I haven't read King in AGES, it's been fun to dive back in! My head was always so full of bookish stuff, I needed an outlet. BADLY, lol. Hahaha on the standard poodle thing! Too funny! I won a copy of the World's Strongest Lib and just need to read it already! Isn't that the weirdest thing to have a phobia about? LOL, what a weirdo. You really have to read it woman! I guarantee that you'll love it. That's right, I guarantee it! Hahaha! I think poodles are a little strange, but I'm not sure they completely creep me out. I'm more of a cat person anyway. I am definitely more of a cat person. I'd have 10 of those little fuzzballs if I wouldn't be arrested, ha! Poodles I haven't seen enough of to understand that, but hyenas, I get that. Especially those from The Lion King as I haven't seen real live ones. It's hard not to want to talk about books on Facebook. There's a small tale behind my fear. I didn't know that GIANT POODLES existed. I saw a pair of them (this was when I was a wee lass) and I thought they were freaking aliens or something. Ever since then...yucko. I love that you're practically in Canada! But don't worry, as much as we complain we still love our neighbours to the south. I noticed that Golden Boy is on your TBR list. I'm going to start it tonight if i can pull myself away from ArmchairBEA! I'm excited to get going on Golden Boy too, I've heard great things! I'm so glad to see that I'm not the only one! LOL, like I replied to someone else: we need a support group! Nice to meet you too Danielle!! Hi Jennifer!! Thanks for stopping by my blog before. I grew up in Wisconsin! Sheboygan, wi! Heard if it? 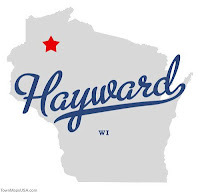 I've never heard of Hayward but I freaking LOVE that huge musky! Holy crap that is so cool! I've absolutely know where Sheboygan is! It's one of my favorite Wisconsin cities to say out loud, lol. We have some crazy names in this state ;) Hayward is WAY up north. I know how you southerners don't think anything above Eau Claire exists, ha ha! You know what? Standard size poodles kind of creep me out too. lol! I don't like monkeys, myself. Nice fish! I can understand Hyenas,they are bit weird looking and vicious...but poodles? Is it the size that does it? I think all poodles look strange but that's because they look ridiculous with all that hair. (Maybe I'm immune because my grandparents use to have one). Also that giant fish is just way too awesome! I wish had a giant statue, someone else mentioned having a cow statue in their town and it made me realize we are without wildlife statues here. Isn't that fish something else? I haven't run across the giant cow post yet, lol. I can't wait to! Nice to meet you too Jana :) A huge yellow dino?! I need to see it, lol! Poodles? Really? I don't like them or anything, but they don't creep me out. Hayward! One of my great uncles had a cabin resort up there. 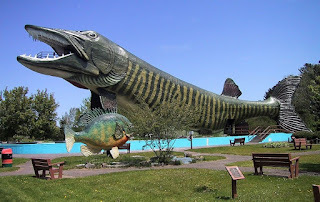 We went several times but I was little and don't remember the giant muskie, but last year I did catch part of a documentary about roadside attractions that included that fish. Do locals have a nickname for him/her? One of the girls I went to message school with is a lumberjack and competes in the Lumberjack World Championships. It's a small world after all. Fun post Jennifer! A black poodle was my childhood pet. She was a rotten little thing though, very hyper! And she had the poodle hair cut ...lol...with the puffs. Only during the holidays though. Hi Jennifer! Love the world's biggest Musky LOL. Even though I'm actually in Canada I think you may be farther north than I am! I totally think the lumberjack world championship would be fun to watch. OK, good to know you were early! I thought I was more behind than I am. You inspired me to post a picture of the huge (tacky?) statue in my city as part of my introductory post. And, yes, everybody must read The World's Strongest Librarian RIGHT NOW! Oh yea, a day early, lol. Whoops! Maybe I was just too excited? I can't wait to see the statue from your city now! Definitely! That book is so wonderful, I just love it! I completely understand your aversion to BOTH of those animals! YUCK! I've wanted to read Under the Dome for a while (I bought it when it first came out), but the length just keeps turning me off... same reason why I haven't read The Stand and some of his others. I do enjoy King's books, though. I love to watch the lumberjack world championship on tv I really find it fascinating and nerve racking I can't even...and that fish :O hands down! So you've seen my little town in action! Exciting, lol ;) That fish is pretty damn impressive. I can see why you'd have no words!! Ha ha! Oh my word! You're description of the town you live in is hilarious! I loved it! Seriously considering visiting their just to see the gaint fish!! Thanks for stopping by my blog! Oh, and my friends/family were the same way about spamming them with bookish stuff on facebook! LOL, thanks ;) And please do visit! I should mention that they put a Santa in the mouth of that thing during the holidays so that would be a perfect time to head to Hayward, ha! My cousin and I started blogging because we'd pretty much exhausted our family's patience with our endless book talk. Blogging is such a wonderful outlet for sharing our love of reading, and it's so great getting to meet others who are also book obsessed! Thanks so much for stopping by! I understand that very well, lol. My poor family ;) You're welcome and thanks right back at ya! Thanks! I'm glad you've found me too! :) I really have been on fire this year. This is the first year I've actually kept track. I wish I had a list of ALL the books I've read over my lifetime. That is an AMAZING statue! I love random Americana like that! It's quite something ;) We seem to have more than our fair share of Americana around here, lol. For such a small town, it sure does have a lot of claims to fame! I bet that musky is quite the sight to see! Can you go inside it or is it just a giant 4 story statue of a fish?! I think I'll have to add Hayward to my list of places to visit in the US. I love towns that have random items that are sight seeing worthy. Like the world's largest office chair in Anniston, Alabama. Poodles are very creepy looking. Male poodles are even weirder, especially when they are groomed with the knob of hair on the tail and at the bottom of their legs. Too feminine, methinks. We do have a lot going on for such a small place. You could call Hayward a tourist trap. I prefer "vacation destination", lol. You CAN go inside the musky! Right to the tippy top. Wow, that giant musky is... well, giant! ;D I'm actually partial to standard poodles, but only because my family had one for most of my life - she was the sweetest thing! But she never had that ridiculous "poodle" haircut. There are some things that should not exist, and that doggie-hairdo is one of them, lol. Aww, I can see why you would like them. I didn't know that standard poodles existed. When I saw one for the first time I almost fell over. I was a kid and I think it scarred me for life! Yup, you betcha ;) I'm way up here in da north, lol. I don't talk like that, I swear. Well...maybe a little. It's awesome to meet another Wisconsin blogger, thanks for visiting me! Yes please do the #DomeAlong! And while you're at it, please read The World's Strongest Librarian too. It's a total delight! Yay Under the Dome!! And standard size poodles? Too funny. I'm guessing that Travels with Charley by Steinbeck would also give you the creeps? I didn't realize you were so far north and that is a GIANT fish! As you said already, yay Wisconsin! I live closer to Madison, but I've definitely heard about Hayward and the Lumberjack World Championships. I was thinking of maybe even attending this year lol. And I have a friend participating in the Under the Dome readalong. Good luck with that! And have a nice Armchair BEA week! I'm having a great time reading Under the Dome so far! Thanks for visiting and yayyyyy Wisconsin! Love the fish. If I'm ever in the neighborhood....I'll have to see that! Thanks for visiting. Hope you enjoy Armchair BEA! I hope you do! We'll climb up the fish and have a book discussion inside his mouth ;) Thanks for visiting Annette! Oh, okay, so you live in THE CHEESE STATE. I was just noting your comment to Andi (skimming it, actually) and I didn't realize you're in Wisconsin. Cool. I love Wisconsin . . . or what I've seen of it (the Dells, like everyone else). Indeed I do! The Dells are pretty popular ;) I get there every couple of years. A Civil War battle site would be so cool to visit. I'm a history junky and I'd totally love seeing that!